Well I guess mid summer is here and maybe even gone, we have now finished over half of our programs and the summer just feels like it is getting started. Crews have been super busy out fixing the damaged trails. Here at dodge we have been busy with projects to try and get this place into the twenty first century. The garden is growing the trees are lush and wild berries and fruitful. Working in the shadow of the northern presidential’s has really been awe inspiring. At the beginning of the year the laundry room door was busted and stuck shut.The only solution I could come up with was to kick the door in. Never having had the chance to really try and do this I was excited at the opportunity to really go at it. I steadied myself lifted my leg and thrusted it forward with more then enough force to kick in this beat door in. It blew open with great satisfaction on my part and my problem was solved, except for having a busted door. Mind you, I only kicked the door because it was a piece of junk so it was on the list to be replaced. It took a while to finally have every thing inline to replace the door. In order to meet federal regulations for size, every time we have to install a door it has to be 36 inches wide from now on. All the current doors are 30. So small chunks of the concert had to be chiseled away so the door could be put into place. The door was installed in one after noon thanks to the help of the central rotator caretaker, Matthew. With a new door, a new laundry table, a deep basin sink, and new washers and driers, the wash room is more prepared to clean our clothes then it has ever been since I have ever been here at camp dodge. Every week people have their off days at camp dodge, so far this season, I have gotten a good couple of handfuls worth of help from those who are around. From garden work to basic grounds needs, to moving furniture. It is a nice thing to have people randomly offer their assistance. It makes my job easier and it makes me feel like that the residents that live here care just as much about this place. At the beginning of last week there was a huge pile of recycles that I was dreading having to deal with. Any normal trash run takes about and hour to complete after you have taken all the different materials to the places were they need to go. But on this fateful Monday we had a double load to take cause all vans were in use so there was no way for Anya or I to take them the week before, Megan was awesome and offered to take the trash to Pinkham. Little did she know what she was really getting her self into. As far as I knew, she had never done this before so the pile was not out of the ordinary for her. Not wanting to scare her away from the chore I deceivingly managed to not mention that this run could take well over an hour. Later that night I was sure to thank here for the dedication of her time to battling the brave fight against the trash. The garden has really taken shape, potatoes and corn are waste high, the cabbage is sprawling like a city and beans, lettuce and kale are all being harvested on a weakly basis. 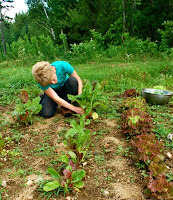 Having planted the seeds that produced food that I eat on a daily basis has really been an amazing experience. With the help of the crews, the work in the garden has been limited to the harvesting and Friday afternoon rush of weeding. The leadership crew has lucky enough to get the duties of some of the harvesting. We have been getting enough rain that all that has to be done is letting the plants do their growing thing. Maybe not as fast as the plants in the valleys, well actually I know they are not growing that fast, but the plants try. I have to remind my self that some of our plants our not as big as I would like, mainly for the reason that up here in the higher valley it is always much cooler and we never get as much sun light. We just got a new helper for the facility, her name is Emily. She was a participant earlier in the year, she loved it so much she asked to come up and volunteer for three weeks. This fall she is going to college for sustainable agriculture. So one of here duties is to to have almost a daily presence in the garden. This has been a really huge help. In August we are going to start really pulling plants like the potatoes, onions and every thing else we can. All to feed the hungry mouths that come rushing out of the woods. It is a rare occurrence to be working with someone for more then half a summer and never ever see them. The back country caretakers that work for the AMC, for witch there are 16 staff, rarely ever see one another when they are in season. One day a summer they all come out for mid summer meeting where they eat and talk about all the different and exciting things that happen to them. What they find in there privy or silliest question they have been asked. They hang out all day and just remember what it was like when they were all training together. August 2 was the day of this meeting and on this day I copped a bunch of trees that were threatening the phone line and with the help of on of the caretakers, Tristan who works at Kinsman, dragged it all down the fire pit. I started the fire at 11 am and burned through the day just picking away at the brush. As the day faded into night, the rain started. It had held off all day until the night hours approached. I really wanted to give the care takers a pleasurable experience, for there gathering. So I continued to stoke the fire and slowly pile more and more brush. Bringing the level of flam higher and hotter. The rain seemed to have no affect on the fire and it was hot enough that no rain coat was needed, one half of you would be dry from the heat, rotate 180 degrees and dry the other side, rotate and repeat. The rain started to pick up even more and they only solution we could come up with was throw all the green wood onto the fire pit. As the rain increases so did the flam. At one point it seemed that the fire it self was evaporating the rain before it even was touching our skin. 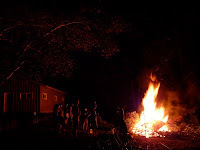 All in all the night was high and dry, thanks to a fire that burned into the mid night sky. It kept every one warm and happy, that when the night was through no one was blue. They say looking into fire stimulates your brain the same way television does but more endorphins are released. Living at dodge we do not have television, but the dance of a fire is more then enough to satisfy my brain. This is 51 Goose clear with issue 3 of the camp dodge journal, have a great day everybody, celebrate excitement!